Peer-reviewed articles and papers have been appearing in scholarly publications for decades. 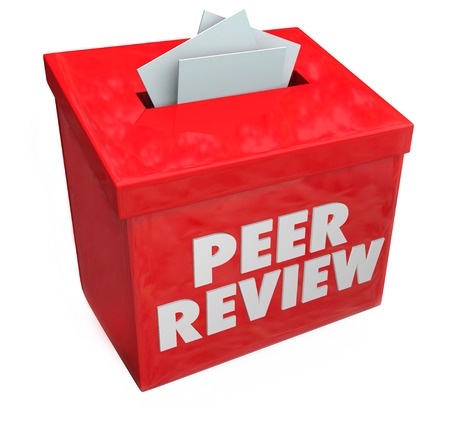 More recently, organizations have embraced the concept of peer review in the workplace. Although peer review can help you achieve your goal of a trained, educated workforce, this potentially sensitive process needs to be managed correctly to avoid unwanted repercussions. Peer review is a process by which employees' co-workers offer their evaluations of the reviewees' performance, skills, competencies, or attitude. The exact process can vary, but in most organizations, employees only review co-workers with whom they regularly interact. Managers can use peer reviews as part of a formal review to give them a better picture of an employee's true strengths and weaknesses. This, in turn, can help managers develop a training and development program that can include the specific skills that each employee needs to improve. Peer reviews can also help managers discover hidden talent — the quiet performers who routinely produce exceptional work without recognition. Since most employees want to know how they are doing and where they need to improve, the feedback from the reviews can help them grow. Employees have a tendency to form cliques or relationships in the workplace. They may feel uncomfortable saying anything negative about co-workers they consider friends. They may also fear that the reviews may be biased in favor of the most popular employees rather than the most competent. Furthermore, they may worry that their own reviews could be tainted by a co-worker who holds a grudge. As stress levels in the workplace are already high, the idea of peer reviews may increase feelings of job pressure and demoralize employees. • The reviewer must be guaranteed complete anonymity. This can relieve concerns over retaliation for a negative comment and give them the confidence to offer honest appraisals. • Reviewers should have a working knowledge of the reviewee's job duties and the skills needed to perform the job. For example, it might be difficult for an outside sales representative to evaluate a cost accountant or for a newly hired receptionist to provide a useful review of a marketing executive. • In a small organization, the need for knowledge of the reviewee's job may need to be secondary to the need for anonymity. In a department with only two employees, for example, it would not be difficult for each employee to determine the source of the peer review if you limit input to just the department. You will need to solicit reviews from employees whose working relationship is not as close. You could, however, ask these employees to answer different questions about the reviewee, perhaps having the other person in the department evaluate technical competency with the other reviewers evaluating the reviewee's "people skills." • Do not tie peer reviews to merit increases or other rewards, and make sure that you communicate this to employees. If employees feel that their raises depend on what their coworkers say about them, they might spend more time cultivating relationships than handling their duties. • Create forms for the reviews that are relevant to the department or position. Positions such as receptionist, sales agent, or customer service representative, for example, may require a greater range of "soft" skills than positions such as database administrator, quality control supervisor, or network engineer. Allow blank spaces on each form for the reviewers to add topics that they feel are relevant but which you may have overlooked. • Communicate your expectations clearly. Make sure that reviewers know precisely what they are to do. Emphasize that you need honest reviews that are fair and unbiased. Encourage them to take their time and think about the questions before answering them. Implemented and administered correctly, peer reviews can provide you with insights that you might never have otherwise discovered. However, you should remember that they are intended as supplementary guidance rather than replacements for existing performance reviews — or your own judgment.